<?xml:namespace prefix = o ns = "urn:schemas-microsoft-com:office:office" /> The Zebra has teeth built for chopping grass so they can eat. Zebras are herbivores; they mostly live for 25 years. Their predators are cheetahs, lions, hyenas, leopards, and hunting dogs. Did you Know that the mare always leads the group? You might think that Zebras only have Black and White stripes but, some Zebras have red, gray, brown, yellow or buff-colored stripes, the colors depend on their age, the area they are in and the time of year. The Zebras stripes (the black and white ones) help them camouflage. 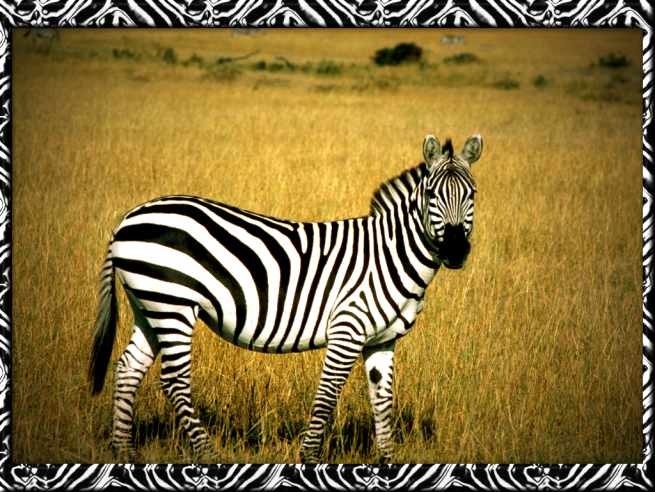 The camouflage is called disruptive.The Zebras adaptation are not more of a behavior to the animal uses. If the Zebra did not have the kind of teeth he/she has right know he/she would suffer from starvation. None of the other animals in their enviorment have the same adaptation like the Zebra, but the horse kind of has the same adaptation because the Zebra is a member of the horse family. Zebras don't just eat grass they also eats bark, leaves,fruit,roots and buds. Did you know there are 3 kinds of Zebras, the common Zebra, the Gravy's Zebra and as you know the Zebra (the regular one). Zebra's are mostly found in Africa. The common Zebra lives in eastern africa and the Mountain Zebra lives in the southern part of Africa. I think it was fun learning all about zebras and I really think people should care more about Zebras. adaption-the ability which the animal or human is born with or gets during its life.